Make hot chocolate for a crowd with this simple homemade recipe for Hot Cocoa that heats and keeps warm in a crock pot or slow cooker. One year I decided to make homemade hot cocoa mix* to give to all the neighbors for Christmas. I had used it many times to make individual cups and absolutely loved it. It was made with various ingredients which included powdered sugar. A few days after Christmas I found myself in the company of a half a dozen frozen neighborhood kids and thought I’d whip them up some hot cocoa with all the mix I still had on-hand. Not wanting to fool with microwaving six individual cups, I decided to throw it all in a saucepan and heat up a big batch on the stove. This turned out to be a mistake. I forgot the mix had powdered sugar in it. Powdered sugar has cornstarch in it. When you boil liquid with cornstarch it thickens. I ended up with a big pot of loose pudding and a bunch of disappointed little people. 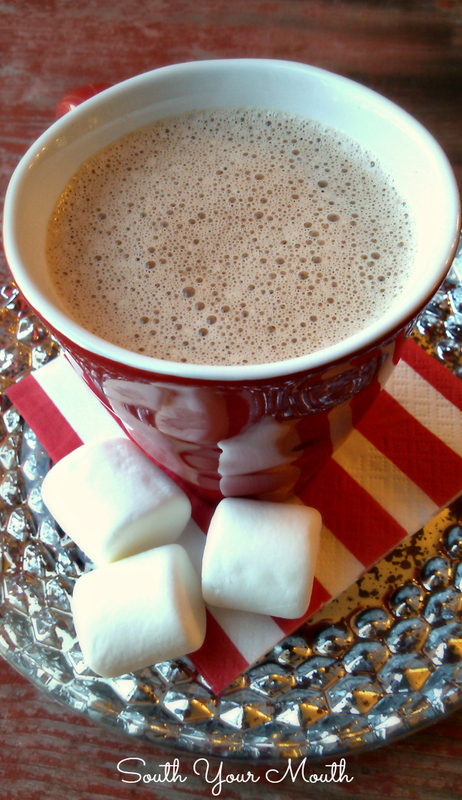 This year I decided to come up with a big batch recipe for hot cocoa. I think this would be absolutely precious to serve with a “hot cocoa bar” with all the possible trimmings: peppermint sticks, marshmallows, whipped cream, sprinkles, crushed peppermint candies, toffee bits, mini chocolate chips, peppermint schnapps, Irish cream and anything else you can think of! Making this in a slow cooker allows you a way to keep it warm without worrying about it scorching or burning but you can absolutely make this on the stove if you prefer. Add cocoa to a cold crock pot. Whisk in 3 cups of milk until well combined. You always want to add wet to dry (instead of dry to wet) to prevent clumping. Add sweetened condensed milk, vanilla and salt and mix well. Heat on high until simmering then add milk to taste*. Return to a simmer then reduce to “keep warm” or low for serving. *I make this with only 3 cups of milk because I love a super-rich, luxurious hot cocoa but Husband likes it better made with more milk. Start with 3 cups then add milk to taste. Makes 8-10 servings. Double recipe if you’re making this for a party or bigger crowd. Store leftovers in the fridge up to one week then reheat in the microwave. *I used this yummy recipe from Brown Eyed Baker for the homemade dry mix I mentioned in the story above. If you're looking for something the adults might enjoy, check out this recipe for Mulled Wine! Hi Mandy, You said in the story about the neighborhood kids this receipe calls for powdered sugar. This isn't listed in the ingredients for the receipe. When do we add the powdered sugar and how much? This one doesn't have powdered sugar. The mix I was talking about in the beginning of the post did but not this recipe. Would it be possible to put up that recipe as well? Mandy, I was wondering how long it typically takes for your cocoa to come to a simmer in your slow cooker. I'm thinking about making this as a treat for my students on the last day before Christmas break and wasn't sure how early to turn it on. I'd go ahead and crank it up early then set on "keep warm" or warm until you're ready to serve. Enjoy!! I made your Crock pot coco for a party I had the other night. I served it at the end of the evening when I served the deserts. It was quite a hit and very easy to make. I'm saving what was left over to take to my daughters Christmas Eve. Thanks for the great recipe! Wonderful! Did you go with 3 cups of milk or add more? This was the best hot cocoa ever! I made it for a birthday brunch for my mom and it was a big hit. Thank you! This is a great idea. Not so useful for me right now, as I live in Bangkok the world's hottest city where hot cocoa isn't always the best drink of choice :) But I'm moving to Austria next year, and it would be great for an Austria party on a cold winter's night :) Will keep this in mind. So good!! My daughter and I made it tonight and it was really, really good. Have you had any success in tripling the recipe? I was thinking of doing it for my office potluck.